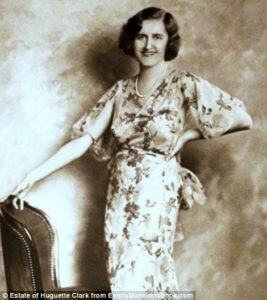 Mark Twain called Huguette Clark's father "as rotten a human being as can be found anywhere under the flag." Dad was William Clark, one of the original Robber Barons of the 1880s, the kind of guy who could have been a regular on HBO’s Deadwood. But . . . he was wealthy. Extraordinarily wealthy. Huguette was born in 1905, straight into Gilded Age High Society. She was a New York City debutante and socialite constantly in the society pages, an early precursor to the Kardashians. Then the depression hit and... she disappeared from the public--went off grid before there was much of a grid to get off of. Her off-the-grid home was a 42-room apartment overlooking Central Park. She lived with her mother, priceless paintings, an enormous collection of rare musical instruments, oceans of jewelry, and one of the largest collections of dolls and toys in the world. She and her mother owned estates in California and Connecticut, but rarely visited them. They stayed in Manhattan, out of the public eye, lived off her father's holdings, and added to their collections. Her father had gifted part of his vast collection of art to the Corcoran Museum in Washington D.C. in the 1920’s, yet her apartments were still jammed with priceless art, rare musical instruments, amazing jewelry. Huguette's mother died in 1963. Her will left $3 million to a museum and everything else to Huguette, the last surviving direct heir of the Clark fortune. The estate was worth about $700 million in today’s dollars. Our reason for writing about Huguette starts in 1991 when she was admitted to Beth Israel hospital with skin cancer. She was in bad shape when she went in, was malnourished, had lesions on her face, had apparently not interacted with anyone aside house servants for years. The hospital took care of her. She thrived. When they tried to discharge her, she refused to go. She made the hospital her home. It’s estimated she paid up to $400,000 a year to stay. Huguette may have been a recluse, but everyone, even in those pre-Google days, knew she was an heiress. Huguette reinforced that almost everyday: her primary way to thank people was to give them gifts. Ridiculously over the top, ostentatious gifts. She gave away millions upon millions. Her mother's favorite museum received cash and paintings; her doctor millions; her nurse millions more, including the proceeds from the sale of a Cezanne in 2000 ($10 million); the hospital received cash and a Monet; her accountant, personal assistant, and lawyer hundreds of thousands in cash on top of their fees and salaries. We won't keep you in suspense: Huguette died in 2011 at the tender age of 104. In the meantime, the gifts piled up. At first, she was told - by everyone it seems - to make a will. Later, she started to be pressured into making one. There's no evidence, whatsoever, of anyone suggesting she execute a power of attorney, or health care proxy, or any other testamentary document. It was all about a will and the disbursement of an immense fortune. A will. At one point, the president of the hospital had his elderly mother visit with Huguette and casually extol the virtues of a will. She didn't get the hint. When Huguette finally gave in, in March 2005, her will wasn't what anyone expected. It was simple and to the point – $5 million to her nurse, everything else to be disbursed as if she had died intestate. That meant it would be split evenly between the 21 grandchildren and great-grandchildren of her deceased half-siblings. If you had stopped reading before this point, there wouldn't have been much of a story. However, Huguette was ninety-nine when she signed that simple will. She was ninety-nine and another month older when she signed her next will. That estate plan was vastly different. It specifically excluded the family. All twenty-one of them. She created an art museum and foundation out of the California mansion. All the art work, except a Monet she personally bought in Paris in the early ’20s, was to go the new museum, along with some cash. The rest was set to go to the hospital and her advisers and nurse. Huguette died just before her 105th birthday after being formally diagnosed with dementia in 2010. Her usual gifting continued unabated right up to her death despite the fact she almost assuredly lacked the capacity to do so. You can guess what happened next - it got crazy, quick. Which will was valid? What gifts were valid? Within weeks, seventeen law firms were involved in litigation. A court-appointed administrator for the estate promptly moved for the return of all the gifts given by Huguette since she took up residence in the hospital. Tens of millions in value. At the time of her death, her estate was valued at just over $300 million. Less than half of what she inherited. What's the difference between incompetence and eccentricity? Between gifting out of gratitude and being pressured to give? Between executing a will on one’s own volition and executing a will to appease a friend/confidant? What seems clear here is that no disinterested person ever looked over Huguette's shoulder as she was was doling out gifts . . . or contemplating a will. Nor were they there to note her deteriorating mental capacity and take measures to preserve her assets. Huguette had never done any planning on any scale, and her last years were a blur of the faces of people coming to her with competing (and self) interests. It shouldn't have been that way. Lately, I've been working on a series of articles for people thinking about ways to protect their estates from the unexpected: lawsuits, divorce... and even themselves, under the influence of dementia or opportunists. You can read about some of the asset protection techniques we use to help families every day in that series, here. One more thing: regardless of the makeup of your estate, you owe it to yourself to see to your personal care planning--your healthcare power of attorney, living will, and the like--as well. Remember, good planning is about taking care of yourself just as much as it is about leaving gifts for others.